One of the greatest changes they made to the chara-ani handshake system was the addition of the “oshi-mashi” option. Sometimes the application period for these singles is so far in advance that a fan’s tastes and interests may have changed by the time the event finally rolls around. Case in point, one of the handshake dates for the next AKB48 single is in late October. It’s FIVE months from now. I may feel differently about the members I chose in five months. I may have started to like a new member. Moreover, for me it is a lot more fun to be able to choose a member to meet “on the day” than to send the CD and ticket back for a 1000 yen refund when a member is absent. I bring this up because there are a couple of members who have recently come under my radar who I would really like to meet. 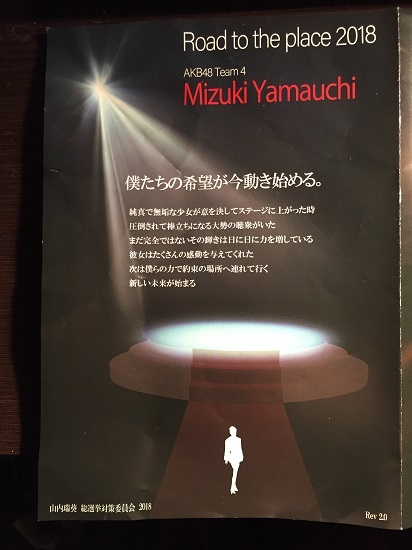 If you have read my recent posts (hint: read the posts about NGT48 and the AKB48 Theater Stage I posted earlier this week) you will know which members I am talking about. Under the old system I would have to wait for the 53rd single events (in the Fall? Winter?) to properly meet these girls. So I had the oshi-mashi option at my disposal, and I intended to take full advantage of it. However, this raised a couple of issues. First, which of my existing tickets was I willing to give up? Second, when I reserved these tickets I had scheduled everything for the late afternoon into the evening. The problem was that one of these members was scheduled for the 9am slot only, meaning if I wanted to see her I would have to get to Makuhari Messe 4 1/2 hours earlier, and then have 3 1/2 hours of time to kill until my next ticket. I would let my body decide. So when I woke up at 5:45 this morning, I figured “Well, I’m up. Might as well get down to Makuhari extra early. I told her what an awesome time I had at the show, her performance was great, and that I really wanted to meet her. She just kept thanking me over and over. I promised I would come back and see her next week too. The guards were pushing me out almost the entire time, but whatever. I have made contact. It was a good connection, and I will see her next week. Oguma Tsugumi (Lane 81) Technically I met Tsugumin the same day I caught her ball at the NGT event, but that was a brief, 3-second hello. I wanted to “keep the ball rollin,” so to speak and have a proper handshake with her. Her line was only a few people deep, so I only had to wait a minute or two. She greeted me with an English “Oh, hello.” Huh, had she forgotten already? So I told her that before last week I wasn’t really an NGT fan, but after catching her ball she has become my favorite member in NGT48. 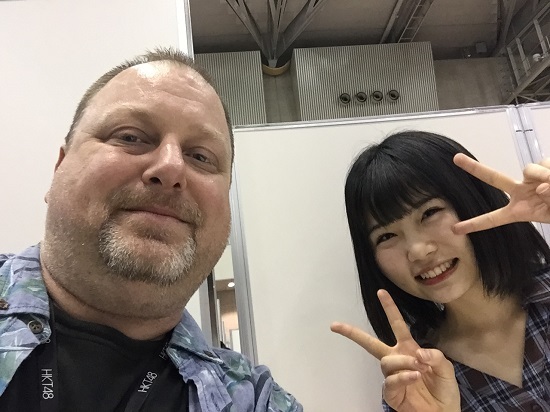 The cute thing was that she was repeating my Japanese back to me as I said it, as if to be sure she understood every word. Very cute. Fuchigami Mai (Lane 40) With the rest of my tickets I was now eligible for the day’s prizes. The big prize of the day were these autographed stickers, which came in different sizes. I didn’t have any tickets for those. In fact, almost all of my tickets, save for one, were for either the 2-shot selfie or the 1-shot video. 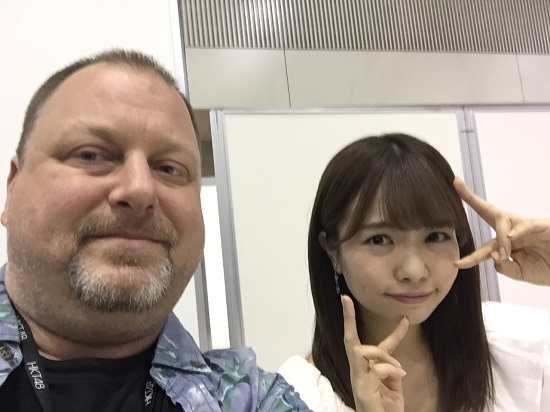 With Maichan I usually run about a 50/50 chance, and on this day I won the selfie. Her line was very short, so I was in and out fairly quickly. I asked her about leaving early today to return to Fukuoka, which she confirmed. I wished her the best of luck at the concert tomorrow, and she responded with “Ganbarimasu……oh, I love you” which seems to be the m.o. of every handshake I have with her. We used to have a lot more to talk about. I need to brush up on my Maichan knowledge. Yamane Suzuha (Lane 37) For a moment I thought this was the slot of my Zukky ticket, and almost walked into the wrong lane. 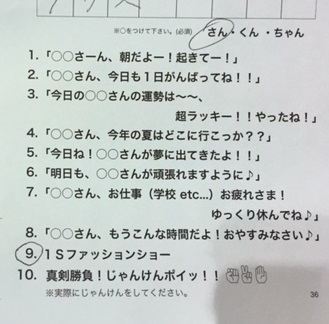 Of course Zunchan’s lane was filled with signs and messages to her fans. It is sooooo cute the way she sets her lane up to give fans a different experience. I lost the lottery for a signed card, so it would just be a regular handshake. When I walked into the booth the first thing she said was “You got a haircut?? ?” Wow, I am amazed she noticed. I acknowledged that I did indeed get a haircut, and then I “wowed” her back by saying hello to Gabriel, her stuffed frog. She was like “Yes, Gabriel! You remembered”. I told her that I love her signs because they help me practice Japanese. This made her really happy, and she told me to continue to work hard with my Japanese studying. It was at this point that I sincerely regretted doing osh-mashi with her ticket on someone else. But I have tickets for her next week, so all good. Yamauchi Mizuki (Lane 36) Zukky’s line was fairly big all day, although it was slightly shorter than usual when I queued up. The good news was that I won the 1-shot video. Which one should I choose? 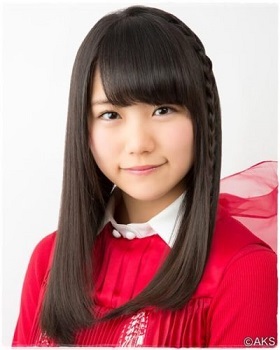 When I was in Zunchan’s lane I noticed that Zukky looked even cuter than usual. So when I saw there was a “fashion show” option to the one-shot video, I picked it. 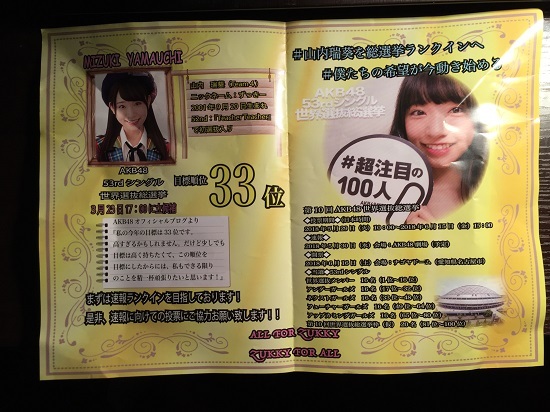 In the meantime one of the members of her SSK committee gave me a flyer, it is very nicely done. Isn’t that a cute video? I told her I selected that because I saw her outfit earlier and thought it was extremely cute. I mean Zukky looks cute regardless, but I love the twin-tails, suspenders, and the choker. Such a great combination. 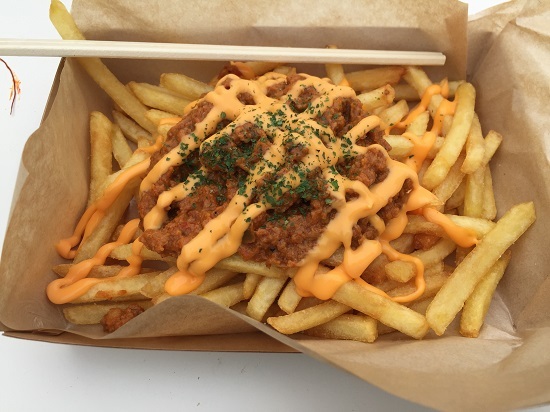 Anyway, this was my only Slot 5 ticket, so I had a big break, and spent part of it eating the new chili-cheese fries at one of the event food trucks. Interestingly, the rest of my tickets were ALL automatic wins, meaning I was assured of getting the bonus prize for each one. Sad, because I want all of these members to be more popular. However, some of us noticed that there were a lot of very short lines throughout the day, and there were a lot of girls with “automatic win” that don’t normally have it. Perhaps it was because people were saving for the SSK? Akiyoshi Yuka (Lane 44) Since I won the bonus prize in all of these slots, there was much less time for talking. 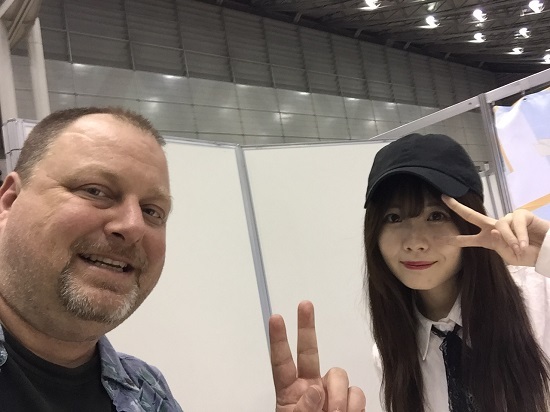 Yukachan greeted me with “Yaho Kurisu!” We immediately set of for the pose and took it. I said “You are leaving early?” She affirmed it, so I mentioned that I had tickets for the cancelled slot. I mean I could have oshi-mashi’d the ticket here with her, or even next week. I simply chose not to use it that way. At any rate, I still wished her the best of luck tomorrow, and I would see her next week. Damn, I keep forgetting to mention the “Calcium Now!” thing she keeps doing on twitter. Sakaki Miyu [Cuca] (Lane 71) When I met with Cuca two weeks ago I lamented that I didn’t have enough to talk to her about, so winning the prize here alleviated that a bit. I actually had a choice between the video or the selfie, but seeing I was going to have four selfies and 2 videos, I chose the video to ‘even things out.’ Moreover, last time I had the video prize with Cuca I cut off the first couple of seconds of the video. I wouldn’t be making that mistake again. Frankly, most of the video script choices they offered were kinda lame. This was the only other one I really liked. Other people said they kinda liked the Janken one as well. Anyway, after the video I quickly thanked her and was on my way. Your choice of video scripts. As I was leaving, Kaotan just happened to mention to me that she saw photos of me on the Wasamin Bus Tour. Huh??? After I got over my initial shock I laughed and said “Yes, the bus tour was a lot of fun.” And then I mentioned I would see her in the next slot for the selfie. It’s a good thing, since I wanted to clarify which photos she saw. Matsumura Kaori (Lane 96) After an 90 minute wait, during which time I saw Yuasa and another staff member head out to the food/smoking area to check something out, I came back in a little early and pre-queued for Kaotan. There was nobody there, so I was first in line. When I checked in, for some reason the girl didn’t give me the 2-shot paper. At first I thought this was because everyone won. But when I saw the guy behind me get one, I went back and questioned them. They said they thought I didn’t want it. Funny, they never asked me. Interestingly, most of the queues were extremely short. Kaotan’s lane had just me and one other guy. Obamina’s lane was completely empty. In fact, when she finally came out she looked completely annoyed. It inspired a pow-wow among a bunch of members, Oba, Churi, Mikoto who seemed to be complaining that all the lines seemed oddly short. Oba kept looking down to the outside saying “Aren’t you guys coming in?” But there weren’t very many people outside either. Kaotan eventually came out. They called me into the booth, and she realized she didn’t have her footstool with her, so I had to wait a minute while she went to get it. As I set up for the selfie she kept trying to instruct me. At one point she got a little frustrated and grabbed my phone to show me, but then gave it back. I eventually set it up to her satisfaction and took the shot. Hey, I’m getting pretty good at these selfies. I think this is my nicest selfie of the day. Good job Kaotan. I asked her where she saw the Bus Tour photos. 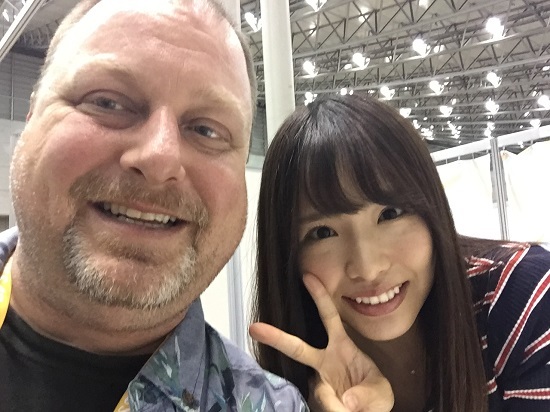 She said she saw them on Wasamin’s twitter, and then she saw a couple more in the responses (One fan took a couple of shots of me picking tea, so I think those are the photos she meant, as well as the group shot) She asked why I wanted to know, and I told her because I also posted Bus Tour photos on twitter. She responded with something I didn’t catch, but I said I would see her next week. Tani Marika (Lane 87) When I got to Tani’s lane it was completely empty, but before I could enter four guys jumped in. I know Tani gets lonely when her line dies down, so this was good. It was just a couple minutes later that I got my turn. It was very quick, we took the pic, I thanked Tani, and was out of there. Perhaps she wasn’t as talkative as usual, or maybe the short queues were annoying her too. It is Sousenkyo time after all. Next week I have tickets to the Jabaja event in Yokohama, and I need to decide which ticket I am going to oshi-mash for Ranchan. I have two tickets in particular that I am thinking of, and since Mio has been a bit flakey about events lately, I will probably use hers, but we’ll see. Tomorrow I have a double dose of Nagara Group, first seeing Minyo Girls’ one-man live in Asakusa, then heading to Minowa for Wasamin’s final 4th Concert DVD release event. So no AKB48 Zenkoku event for me, but a lot of fun nonetheless.